Dietrich von Seggern received his degree as a printing engineer, and in 1991 started his professional career as head of desktop prepress production in a reproduction house. He became involved in research projects for digital transmission of print files, and moved to the German Newspaper Marketing Organisation (ZMG). There, Dietrich was responsible for a project to enable the digital transmission of newspaper ads. In 2002 he joined callas software as Director of Product Management, and subsequently introduced callas’ PDF/A related products for the archiving industry. After becoming Business Development Manager in 2010 Dietrich became one of the Managing Directors of callas in 2016. PDF Association: At the PDF Days Europe, you will be hosting a presentation titled “PDF’s ISO-standardized subsets: a tour” – what’s that about? 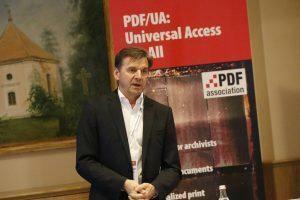 Dietrich von Seggern: This session delivers an overview about PDF/X, PDF/A, PDF/E, PDF/VT and PDF/UA. Their specific use cases are explained and how related requirements are transferred into provisions of the respective standards. The development of the standards also show how the general use of PDF has been changed over time starting with PDF/X where PDF is an intermediate product for printed paper to PDF/UA where PDF is much more than what could be printed. Dietrich von Seggern: We have several PDF based standards such as PDF/A or PDF/X, each defining a subset of PDF for a certain use case. In this session I want give an overview about all of them. It will not be possible nor is it the goal to explain technical details, I plan to explain things more on the user level having e.g. product managers or marketing people in mind as a target group. Basically everybody who maybe only knows one or two of them and wants to get a good overview should join me in this session. Dietrich von Seggern: A good overview about all PDF standards, information that might be useful when working with PDF files that adheres to a certain standard or when having to convert into such a standard.